Tripwire on making games moddable: "It's a lot of work. But I think that it's worth it." Tripwire Interactive is one of the handful of studios that have made the jump from modest modding origins to professional, full-time, make-your-mom-proud game development. Until last year, the studio operated out of the bottom floor of a Georgia church. And through releasing Red Orchestra 2 and the 1.7-million-selling Killing Floor ( originally a mod ), Tripwire has encouraged and regularly rewarded modders and map-makers . "It was a honestly a massive effort. At some point and times we had our entire engineering team, our entire code team, working on just supporting the SDK while we were still developing [Red Orchestra 2]. 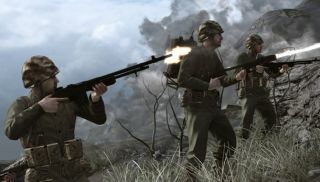 There would be like a month where we'd be like, 'Okay, this month we have to catch the SDK up so that the guys in Rising Storm can keep working.' It was a lot of work. But I think that it's worth it. One of the big strengths of the PC as a platform is moddability," says Gibson. In addition to Rising Storm . Gibson mentions that more Red Orchestra 2 mods are in development: In Country: Vietnam , WWI mod Grabenkrieg , and vehicle add-ons. "As a developer it's so fun to me to be able to experience that content. Because when you're developing something, you see it ... and you play it a thousand times before it's finished. But when mod content comes out, I get to experience it just like a fan, and it's very exciting." Gibson also offers a polite critique to DICE about Battlefield 3's lack of moddability. "They've openly come out and said 'We won't give out mod tools because we don't think that modders are smart enough or good enough--I can't remember the exact quote--to use our tools. And I think that that's just a shame because one of the things particularly in the early days that made Battlefield such a success was Desert Combat. I've heard from mostly reliable sources that 50 percent of the people that were buying Battlefield 1942 were buying it to play Desert Combat. And not giving out mod tools has limited Battlefield 3 to any of that kind of innovation," says Gibson. "It's a real shame because, you know, there might be some really cool shooter that would come out of that, or a really cool mod. And the fans are losing out because of that." Tripwire's currently having a ludicrous sale on Red Orchestra: Ostfront 41-45, Red Orchestra 2, and Killing Floor through the Humble Weekly Sale , which runs through this weekend.